Few biological surveys have been conducted in the Pui Pui Protected Forest in the decades since it was established in 1985, and “the potential for additional discoveries is enormous,” according to one researcher who helped discover the three new frog species. The three new species all belong to a family of land-breeding frogs called Craugastoridae whose embryos hatch as froglets rather than going through a tadpole stage, which allows them to survive in a wide array of habitat types with sufficient moisture. The researchers say they will describe three more new frogs as well as two new lizards they’ve discovered in the Pui Pui Protected Forest in future papers. Three new frog species have been discovered in the montane forests and Andean grasslands of Peru’s Pui Pui Protected Forest. Rudolf von May, a postdoctoral researcher at the University of Michigan and one of the authors of a paper describing the three new species that was published in the journal Zootaxa late last month, said in a statement that there are many more species discoveries to be made in the region — and teased the fact that he and his colleagues might soon be announcing further new finds of their own, including frogs and lizards. 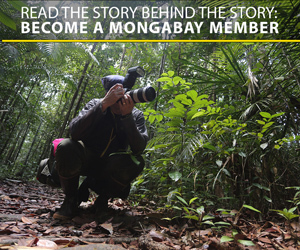 Few biological surveys have been conducted in the Pui Pui Protected Forest in the decades since it was established in 1985, and “the potential for additional discoveries is enormous,” von May added. The three new species discovered by von May and the other co-authors of the Zootaxa paper — an international team of researchers from the Czech Republic and Peru in addition to the United States — all belong to the genus Pristimantis, a large genus of frogs containing close to 500 species found across Central and South America, from Honduras down to southern Brazil, as well as in the southern Caribbean. 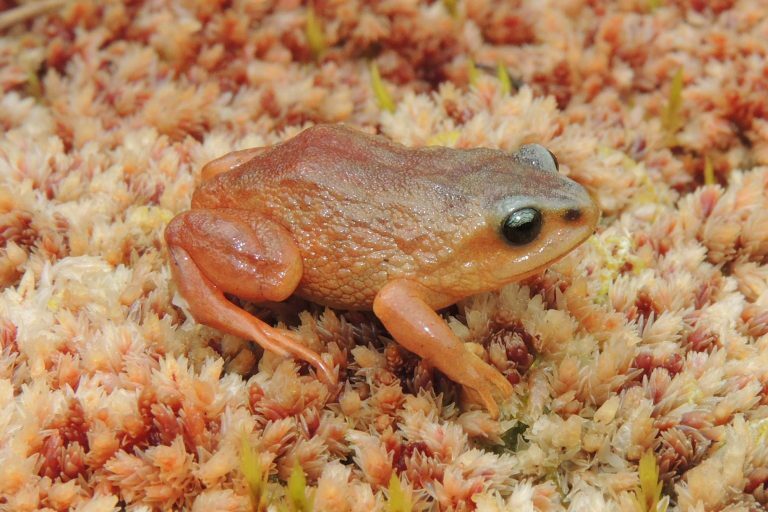 The Pui Pui Rubber Frog, Pristimantis puipui, is known from a single site near Laguna Sinchón, which marks the approximate center of the Pui Pui Protected Forest, at an elevation of 12,762 feet above sea level. The species name is derived from the Quechua words “pui pui,” meaning “eyes of water,” a reference to the many lakes of the Pui Pui Protected Forest. Photo Credit: Jiri Moravec. All three species are less than three inches in length and belong to a family of land-breeding frogs called Craugastoridae, whose embryos hatch as froglets rather than going through a tadpole stage, which allows them to survive in a wide array of habitat types with sufficient moisture. Edgar Lehr of Illinois Wesleyan University in the US, the lead author of the paper describing the new species, said that the high elevations of the Peruvian Andes appear to have been the scene of an evolutionary radiation for Craugastoridae frogs, which is when a single ancestral group produces many descendant species adapted to different habitats. About 70 percent of the Pui Pui Protected Forest, which covers 150,000 acres, is composed of Andean grasslands, while 30 percent is cloud forest. The Hill Dweller Rubber Frog, Pristimantis bounides, is known from two sites at elevations of 10,991 feet and 11,362 feet. 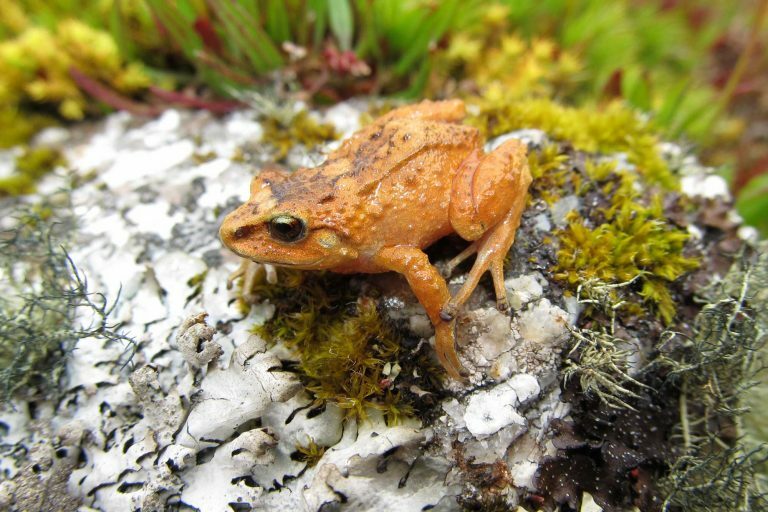 The species name “bounides” is derived from the Greek noun “bounos,” which means “dweller of the hills” and refers to the habitat of the mountain forests where this frog was found. It is an area of mixed vegetation including large layers of mosses, small bushes, trees, and Peruvian feather grass. Photo Credit: Rudolf von May. The third new species, Humboldt’s Rubber Frog (P. humboldti), was named in honor of German naturalist and explorer Alexander von Humboldt. 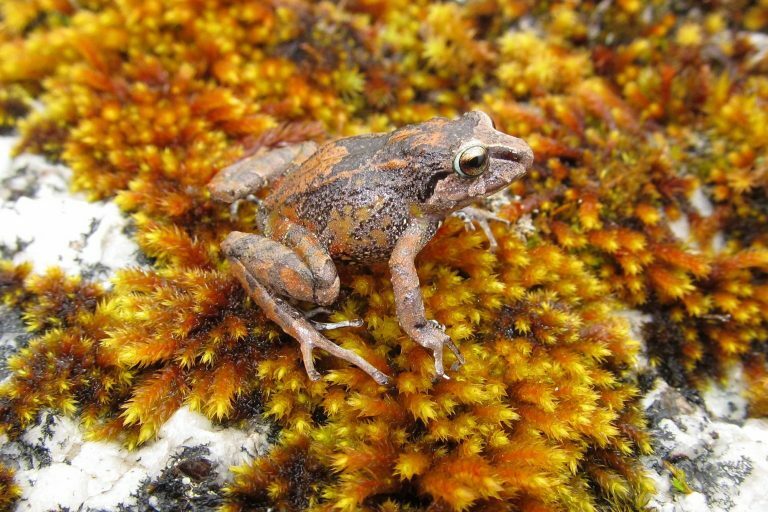 The researchers note that, while habitat loss in the Peruvian Andes driven by conversion of forests into agricultural and pasture land is a concern, much of the habitat preferred by the newly discovered frog species is formally protected. Lehr, von May, and team described two other new species of Peruvian frogs earlier this year, P. ashaninka (named for the Ashaninka, an indigenous people from the Peruvian and Brazilian Amazon) and P. attenboroughi (named in honor of Sir David Attenborough, the naturalist and BBC broadcaster). The researchers say they will describe three more new frogs as well as two new lizards they’ve discovered in the Pui Pui Protected Forest in future papers. The Humboldt’s Rubber Frog, Pristimantis humboldti, is known from a single site at 10,886 feet. The species name is the patronym of the German naturalist and explorer Alexander von Humboldt (1769-1859), who traveled and studied the New World between 1799 and 1804. Photo Credit: Rudolf von May.